Champion Projects are a multi skilled workforce of City & Guild qualified electricians, experienced carpenters, and kitchen fitters covering Poole, Bournemouth and Dorset. With over 15 years’ experience, Champion Projects, offer a complete ‘one stop’ service for your project. Champion's electrical contractors provide a range of domestic and commercial electrical services in Dorset including complete electrical installations, electrical rewiring, cable installation, internal or external light installation and testing as well as other services that you would expect from a qualified electrician. The experienced team of carpenters at Champion Projects can undertake a variety of carpentry projects from stud work and kitchen fitting to shop fitting and installing built in furniture. Champion Projects, Poole, work with an extensive range of suppliers in Dorset to source numerous floor coverings including domestic wool & polypropylene carpets, laminate flooring, solid wood flooring and Karndean. Their flooring specialist in Poole can provide a complete package for your new floor covering or simply a supply or install only service. They also have a superb laminate flooring fitter that can help recommend the right application for your new floor. Champion Projects cover all aspects including design, supply and installation of your new kitchen. Our kitchen fitters in Poole undertake projects across Dorset that include removal and disposal of the old kitchen, then fitting all new cupboards and appliances, including the electrics and plumbing of your new installation. Their team of plasterers and decorators offer a range of services including plaster boarding, skimming, metal stud work, timber stud work, dry lining and coving to give customers the perfect finish to their project. Champion's plasterer services in Poole and Bournemouth come highly recommended, their plasterers in Poole and Bournemouth provide perfectly smooth finishes for your home or business. 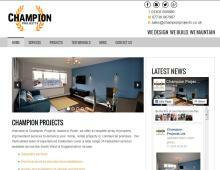 Contact Champion Projects today for a FREE no obligation quote.